The purple-haired, overweight mobs of millennial's who don't work and instead choose to spend their time dressed in Black costumes terrorizing the city of Portland in particular, is finally getting a taste of their own medicine. The incident stems right from the Antifa playbook and calls for those who disagree with their political ideology to confirm or face the threat of physical violence. Ironically, the far left's effort to deplatform any group who they don't like such as Alex Jones and now Gavin McInnes's group the "Proud Boys", is now starting to backfire on them. While the groups like ACLU and BLM used the pretenses that the groups they went after such as the "Proud Boys" encouraged political violence. The accusations around enough for PayPal to ban "Proud Boys" form their service, but what Antifa thugs didn't expect is that the company wouldn't be selectively enforcing their hateful speech policy as so many other social media groups have opted to do. Firing Roseann for one inappropriate joke made outside of the show on her own personal time yet women like Kathy Griffin who pretended to decapitate President Trump and even posed with a bloodied and dismembered head of the current president. 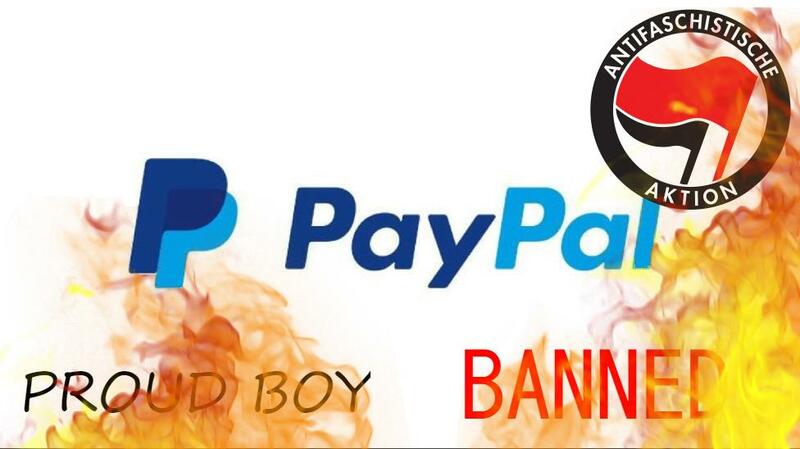 The real kicker is that although PayPal gave the "Proud Boys" the boot, PayPal also gave the far-left Antifa scumbags a permanent ban of their own, essentially for doing exactly what they have been complaining about. PayPal also went after English Defense League founder Tommy Robinson, who has actually helped his country greatly at a great personal cost. Yes, that is it. It is infuriating to see these "guidelines" enforced on groups that have reached the far end of the spectrum, from terrorists to anti-terrorists. Why aren't these so-called "guidelines" being used to take down the people calling for white genocide or calling for the assassination of President Trump? PayPal is a company I used to respect ever since Elon Musk and his partners started it. But they have a Lucasfilm problem right now. What do I mean by that? Well, Lucasfilm is an echo chamber filled with far-left, purple haired, socialists who think they know what's best for everyone else and if you don't agree your a bigot, sexist, or a racist. Too often the response to legitimate criticism from customers to their favorite companies has been "If you don't like our product, then don't buy it". Or even worse, you are called a misogynist, or a racist simply for having some legitimate criticism. Sadly that is what is happening with PayPal. Fans are giving up on Star Wars as you can see by the declining profits of each film with Solo actually losing money. PayPal needs to replace the people at the top of the company propagating the same far left ideology that is destroying Star Wars, the greatest sci-fi franchise of all time.